Et tu, Proenza Schouler? Really? 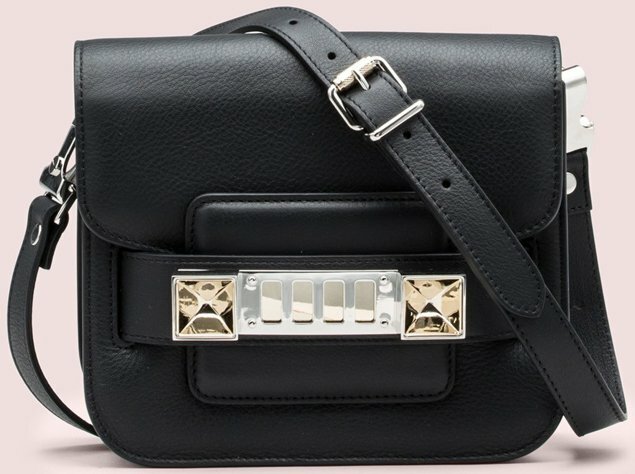 Proenza Schouler PS1 Keep All Small Satchel. It’s been a rough week already and it’s only Tuesday. First Balenciaga, makers of my favorite handbags of all time, decided to desecrate one of their classic bags with inexplicably bad fur trim. Now Proenza Schouler, another of my can-do-no-wrong favorites, has made a version of their usually lovely Proenza Schouler PS1 Keep All Small that I just…don’t like. This bag is not as egregious as the Balenciaga tote, for sure, but most Proenza bags are so effortlessly cool and (in my mind at least) perfect that to see one of the brand’s classics miss the mark is jarring, to say the least. I like the shape and I like the materials when considered individually, but together? Eep. The issue here is one of tone. Proenza has done well with its canvas PS1s in the past, and this is the same warm beige material that they’ve always used. Layering that with leather or embossed python sounds like a great idea in theory, but with this trim, they chose a color story that has absolutely nothing to do with the base color that’s sitting under it. The foundation of the print is graphic white, cool gunmetal grey and ice blue, which could look more random against a warm neutral. The fiery yellow and red-orange are the final icing on the WTF cake. 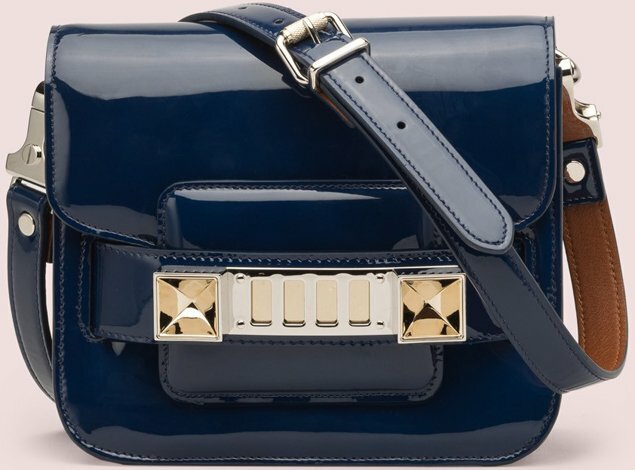 Proenza Schouler is usually a master at mixing colors and patterns in ways that make me swoon and endlessly re-plan my wardrobe budget, but I can say with confidence that this is a bag on which I will pass. That’s too bad, because with a few tweaks, it could have been quite beautiful. Buy through Net-a-Porter for $1250. For now, we are seeing a storm of mini sized designer bags running out of the factory – to name a few; the Louis Vuitton Capucines BB tote, Prada Extra Mini Saffiano Bag, Lady Dior Mini Tote, Fendi Mini Be Baguette Bag, the Celine Mini Trapeze Bagand we can go on forever. Presenting Proenza Schouler Resort 2015 Bag Collection. Up until now we have only images of the new clutches and shoulder bags. They are streamlined and graceful, refined with the new Proenza Schouler closure instead of the iconic metal tab. The new edition of bags goes well with chic dresses and pumps that you will love to wear for work. The colors and design are purposely crafted to go with mixed color skirts and shirts. Mix it in the style of Proenza Schouler, go black, grey, dark blue and white with daring stripes. These bags are an extended version of the Fall 2014 Collection. The bag comes with a shoulder strap, it’s now available in red or black, made from leather and suede front flap. Measuring 7’ x 2.5’ x 5.5’. Presenting the Proenza Schouler Hava Chain Bag. The brand’s newest handbags was first introduced during theSpring/Summer 2016 runway show. It features a flap front with a metal clasp closure. There are two styles available for the Hava Bag, the Clutch and Shoulder Bag. Both bags features a rectangular chain strap. It has a leather interior with two pouch pockets, and an exterior back zip pocket.